Elliot Johnson and Reid Brignac have been designated for assignment by the Tampa Bay Rays. 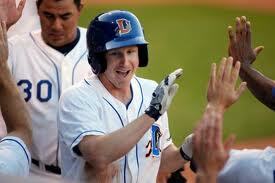 Both of these ballplayers have spent a lot of time with the Durham Bulls. Johnson ranks #3 on the all-time Bulls list and played in 410 games in a Bulls uniform. Brignac is #7 at 303 games. And both did reasonably well on the all-time OPS list, with Elliot coming in at #14 (.735) and Reid just behind him at #15 (.715). Is there any chance that either player will show up in a Bulls uniform? Well, they don’t seem to think so. But you never know. They sound upbeat in their interviews with Marc Topkin of the Tampa Bay Times and again with Roger Mooney of the Tampa Tribune. (Although I suppose it could have been the same conference call. I'm not sure how these things work.) In the case of Elliot Johnson, I’d have to agree that he should be able to find a home somewhere else. Reid Brignac has a fine glove, but he hasn’t had a good season at the plate in a long time. It certainly looks like the Rays have lost confidence. I have to admit that in his first year as a Bull (2007!) I was unimpressed with Elliot Johnson. However, I didn’t know he’d been pushed over to 2B to make a space for the upcoming superstar shortstop, B.J. Upton. 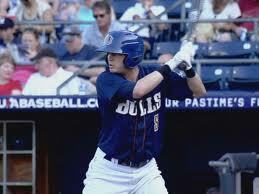 Elliot played some terrific baseball over the next few years for the Bulls. I sure hope he finds a home. If not, he will be more than welcome by Bulls fans (at least one of them). Reid Brignac has some of the best hands in the game. But he’s being pushed around both in St. Pete and at AAA with the ascension of Tim Beckham and Hak-Ju Lee. He’s helped the Bulls win a lot of games. And he’s provided on-field leadership in some tough moments. Good luck to both young men! Dane DeLaRosa joins the DFA parade, let go to make a spot for Luke Scott. Thanks, Orin. Just saw that. Unlike Brignac and Johnson, de la Rosa just might make it through waivers, and he might be willing to come back to Durham. He's got pretty solid numbers, as I recall. Will have to do some digging to confirm that.